No game room would be complete without the proper furnishings. 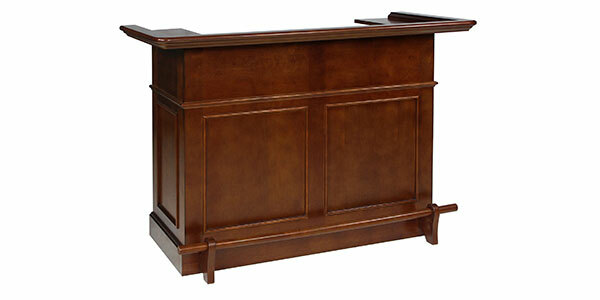 At Austin Billiards we offer the very best in game room furniture from home bars to poker tables and accessories. Our game room furnishings come in a variety of styles and colors, making it easy for you to find something that will fit your home décor and budget. 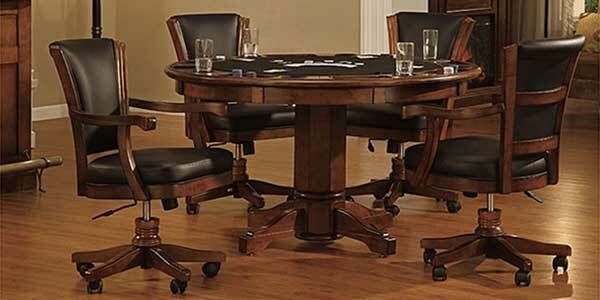 Having an authentic gaming table makes that poker game that much more fun. 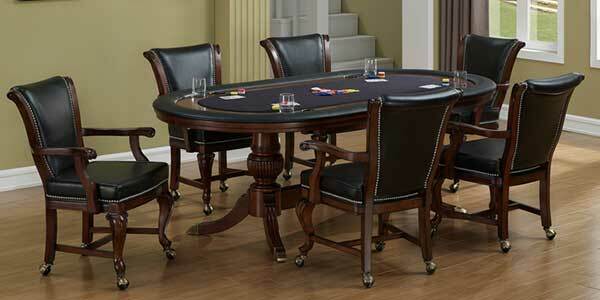 From Texas Hold ‘Em to 5-Card Draw the quality of our gaming tables is a sure thing. Whatever your game, we have a great selection of gaming tables that range from professional tables to reversible tables to poker table tops. 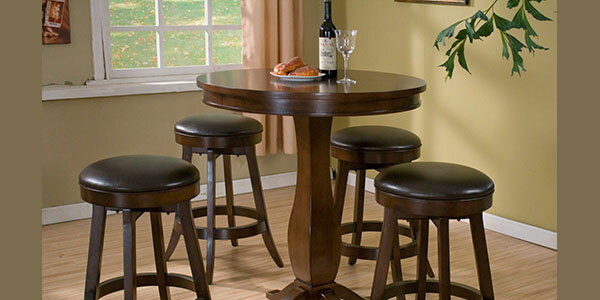 Now that you have your ideal home bar, you just need the perfect seats for your clientele. You’ll find a great selection of bar stools at Austin Billiards from swivel, to modern, to commercial grade, we have the stools you need to keep your guests seated comfortably all the way through to last call. Do you have a picture in your mind of your own home bar? 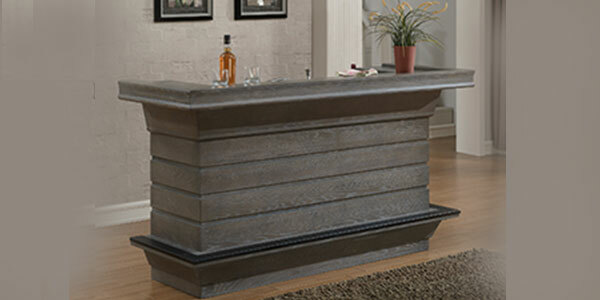 Whether your ideal home bar is simple or off the charts, we can make your home bar dream come true. Our impressive variety of indoor bar styles and designs makes it easy for you to find just the right piece to fit in with your tastes and budget. 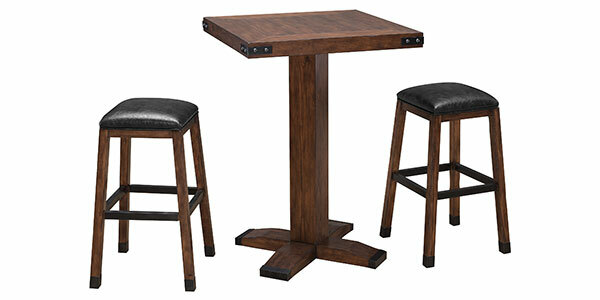 Create your own pub or bistro with stylish pub table and chair sets. Whether you’re having a night with family or friends these tables set the mood for an evening of fun. With our selection of styles and stain choices you’re sure to find the perfect set to fit with the theme of your décor. If you’re looking for billiard table lighting, look no further than Austin Billiards. No matter what billiards game you’re playing proper lighting is important for players and spectators alike. We offer a wide selection of lighting fixtures for your pool table that will accent your room beautifully, while providing the perfect light to the playing area. Now that you have the perfect pool table, the proper lighting, and game tables set up, your walls are asking for a little attention too. Have no fear because we carry a nice selection of game room art to add just the right finishing touches to your awesome game room. There is nothing that makes us happier than helping you bring the vision of your ideal game room together. With our wide selection of styles, stains, and colors, outfitting your perfect game room is a snap. Come on down to our huge showroom and see what we have to offer, we know you won’t be disappointed. If you have questions, please don’t hesitate to contact us or call and we’ll be happy to help you. Revive the fun of friendly competition with game night at your house. This 54" round table features generous drink holders and chip trays with removable rubber inserts to protect from spills. Flipping the game surface over reveals a beautiful dining top. This Elite set comes with 4 black faux leather, swivel, tilt and adjustable height chairs that will allow your guest to relax in comfort and style. 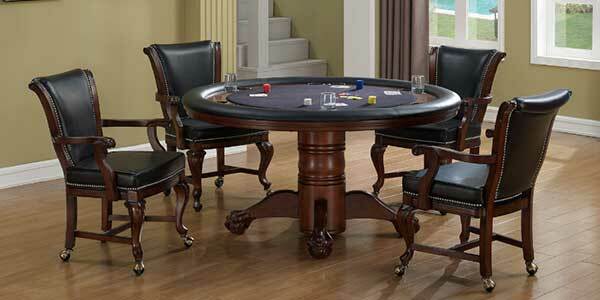 The stately Royale Game Table is almost regal in disposition and offers up gaming on a whole new level. This opulent oval table seats six and touts a handsome suede finished base, along with elegantly tooled legs that branch from ample end column supports for an august look and feel. The surface of the table is just as dapper with a wide frame of classic black vinyl and slightly recessed oval felt playing surface. It is paired with six Napoli Chairs, each of which offer ultimate comfort with wide, deeply cushioned seats and backs, and contoured arms on brass rolling casters. Check out this modern look take on a traditional game table with new functionality. Go from dining to game night in seconds with the Sterling Flip Top Game Table. 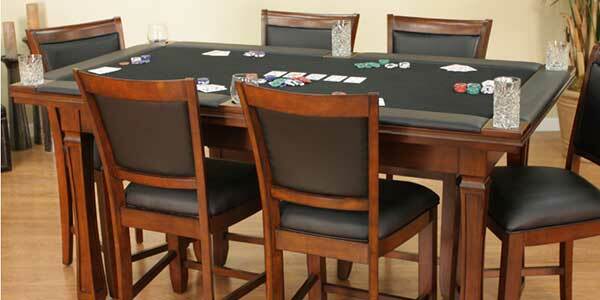 The inner circle of the table easily flips from dining top to game top with two simple slide locks. 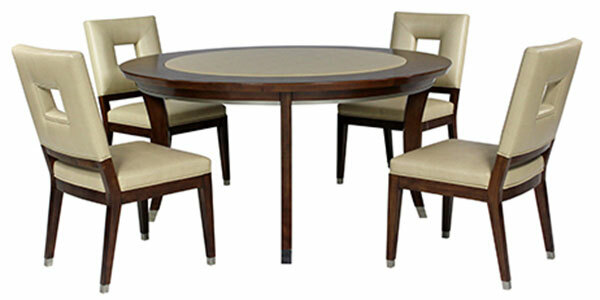 This table top is a large 54” diameter and features unique arched legs with brushed nickel accents. A versatile piece for any home. The dapper Full House Game Table offers up a beckoning poker surface featuring a wide vinyl edge around a felted, recessed playing surface on the other. The column base of the table is elegantly tooled with double ring accents from which a quartet of clawed feet emanate. The august table is paired with four durable and welcoming Napoli chairs, each on rolling casters and offering deep cushioned comfort with padded and upholstered backs and seats. 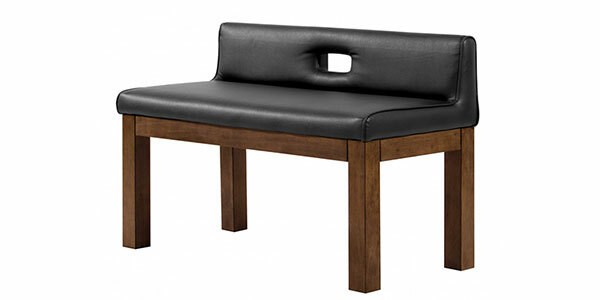 Set yourself up in style and comfort with the Legacy Dining Bench. 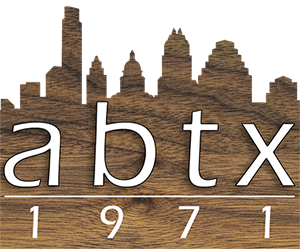 This seat fits perfectly with our Legacy Baylor billiard table and dining top option. Six benches will easily fit around any 7’, 8’ or 9’ billiard table to convert your billiard table to a complete dining set. Add a spot in your game room to enjoy a drink or some hors d'oeuvres. With the quality and style of Legacy's Sterling collection, the Sterling pub table easily matches Legacy's billiard or shuffleboard tables. The Sterling backless stool has many uses in your game room. Available in 30" pub height, these stools are great for use in your kitchen, around your sterling bar or in any room of your home. Classic style and amazing functionality, all wrapped in one! Our Classic 60" Bar features three bottle chiller, lockable cabinet, adjustable shelves and stemware racks- everything you need to enjoy a relaxing night with family or friends. The simply stunning heavily distressed Solid ASH or PINE wood grain is seen on every part of the Cimmaron & Winchester Pub Table. The metal accents on the corners and feet add to the rustic charm. It is as sturdy as it looks, and can handle everyday wear and tear. The barstools are eye catching as well as functional. 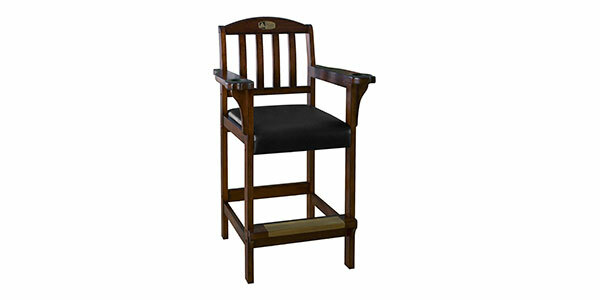 They are made with a comfortable worn faux leather upholstered seat (and back on backed stool). The extended length, Sterling 92" Bar speaks of confidence. The long, clean lines with raised panel features is a great addition to the party room, family room or game room. Sterling 92' Bar comfortably seats six barstools. Take advantage of the ninety two inch features including two dry sinks, drawers, storage cabinet, adjustable shelves and a storage cavity large enough for a 25 x 33 inch refrigerator. 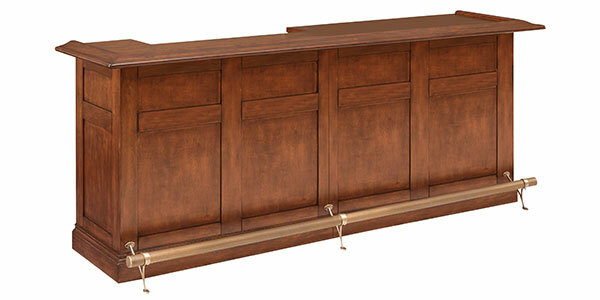 With its stunning brushed metal hardware foot rail and door pulls, your guests will never want to leave your home bar.